I'm a Christian but somehow, two nights ago, I found myself celebrating the Lunar New Year at a friend's house. Having never done so before, I marveled at all the traditions the Chinese and some Filipinos observe to usher good luck into the new year: Wear red. Put eight 1-peso coins in your right pocket. Make sure the money in your wallet amounts to an even number. 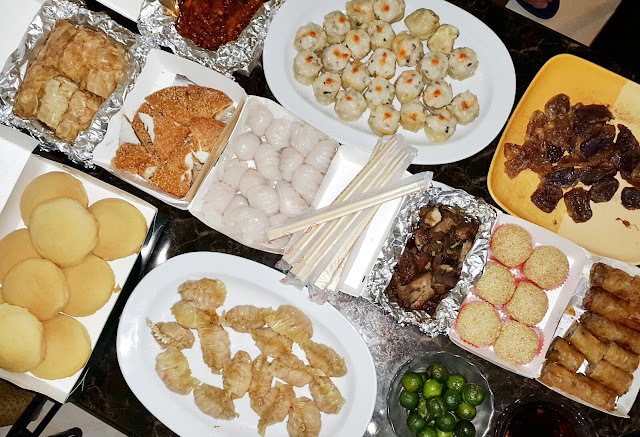 Have fish and pancit with long noodles as some of the dishes on the table, along with a cup of uncooked rice topped with coins and at least an egg (a money charm). I didn't care much about whether the dishes we had served were lucky. We didn't have fish or pancit but we had lots of takeaway dimsum from this fantastic Chinese place at Sta. Lucia Mall. I ate much of it with gusto. When my friend Belle brought out wishing paper that we were supposed to write our wishes on and then burn later, I had to ask some questions. Does the "even numbers only" rule apply, meaning I can't write just one wish? Can it be in bullets or do I have to write it in essay form? I felt like a student again, conscientious and competitive, and as such I was first of the six of us to finish. I rarely go home, much less see my grandparents who live about a ten-minute walk away from our house in Cavite, so I was surprised to see the condition they were in when I visited them with my mom and niece two days after last Christmas. My Nanay (82) struggles with stairs now, so she and my Tatay (83) have resorted to sleeping downstairs. For support when they walk, they both rely on canes, rails my dad mounted on their walls, and a caregiver they've hired. When we went to the mall the next day to have an early birthday celebration for my Nanay, she fell to the floor trying to take a seat at the restaurant despite having me beside her as a guide. It was a heartbreaking sight; I had to fight back tears as I helped her up. It wasn't just my grandma's deteriorating motor skills that got me tearing up during my visit. Entire conversations now have to be repeated at times for both my grandparents' sake, my Nanay for her forgetfulness and my Tatay for his poor hearing. My Lola Charing, despite retaining her chattiness, is no longer as energetic as she used to be (and she used to be really energetic). Thank goodness, my mom, dad, brother, sister-in-law and niece seem to be okay, though I cringe at the thought of my ten-year old niece happily chatting with a boy on Facebook messenger (in secret, or so she thought; she has a smartphone with really small text, I have bionic eyes). "To one of the most talented persons I know, thank you for sharing some love on this endeavor. Continue to be very inspiring with your own craft." I've never considered myself talented, just somebody sufficiently capable of accomplishing most tasks laid before him (in other words, a jack-of-all-trades), but I'm inclined to accept a compliment like above from someone who, at the age of 24, self-published a book he had started working on when he was barely a teenager. 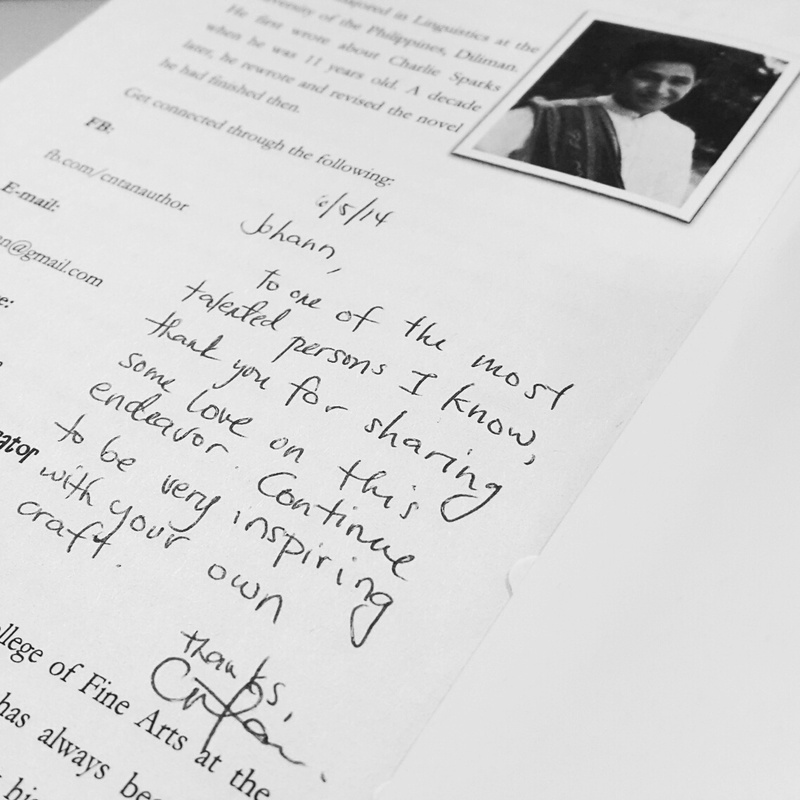 You, Cy, are one of the most talented persons I know, and through your book and the people you shared your brief life with, your memory will live on. May you rest in peace, @cyrilltan. Last Sunday wasn't just the eve of the Lunar New Year. It also marked the second anniversary of that tragic Florida bus accident in Bontoc, Mountain Province. After a couple of surgeries and several sessions with a physical therapist, Cams is doing so much better, though it would still take her a while before she could walk again without needing a cane. Cams' friend Michal has been taking trips in and out of the country, probably setting off metal detectors as he goes. Not everyone has been as fortunate, however. Ayen had to quit her job months ago because although her condition has improved greatly, she remains unable to stand on her own. She still misses her late husband David, and so do her sons Agung and Amian. Before Cams and I left her apartment to get the takeaway dimsum we were bringing to our friend's house, she received news of one of her favorite UST professor's passing. She had gasped loudly and somehow, half certain, I joked, "May namatay na naman?" ("Did someone die again?") Turned out I was right. That night, I could have included in my wish list a successful hike to the Seven Summits, a new laptop, a fast metabolism and people around me spending less time on their smartphones. But what with death constantly reminding us that we are finite, I figured I only needed a very short, still-somewhat-selfish but practical list: good health for my loved ones (especially my parents and grandparents), career development, financial stability and a closer relationship with my family. Those should be more than enough to keep me happy this new year and after. The ashes of my wishing paper. Haaay beb, I will definitely miss our kulitan together. Still can't believe your'e already gone. I love you and I will miss you Cy.